Panera releases new Whole Grain Wraps to add more breakfast sandwich options. 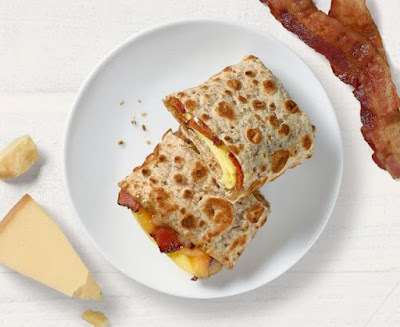 - Maple Bacon, Egg & Cheese Wrap - Bacon glazed with maple, scrambled egg, smoked Gouda cheese, salt, and pepper in a whole grain wrap. - Chipotle Chicken, Egg & Avocado - Smoked pulled chicken breast, scrambled egg, smoked Gouda cheese, fresh avocado, chipotle aioli, peppadew peppers, cilantro, salt, and pepper in a whole grain wrap. - Mediterranean Egg White Wrap - Egg whites, feta, parmesan, spinach, smoky tomato confit, basil-white bean puree, salt, and pepper in a whole grain wrap. The all three breakfast wraps go for $5.29 each in my area.